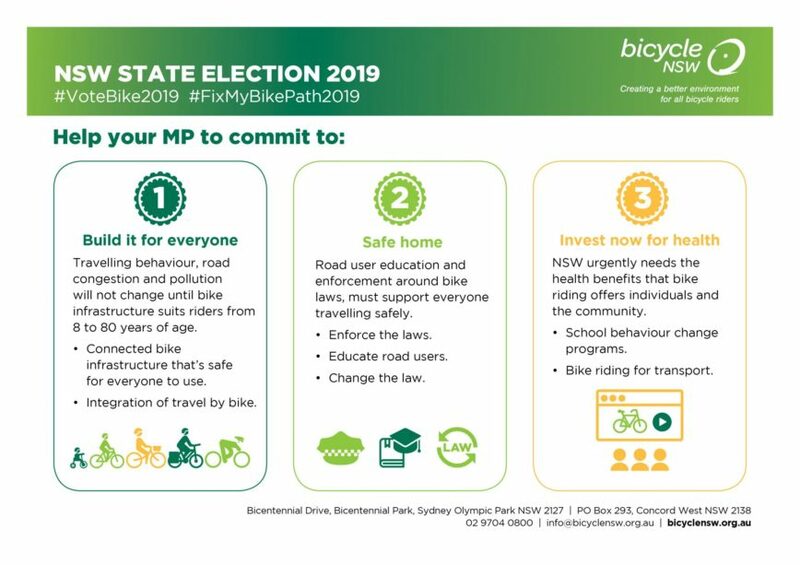 As NSW prepares to go to the polls on March 23rd Bicycle NSW is encouraging people to let their MP and candidates in their electorate know what is important to them. Nearly a million people ride a bike each week in NSW. Almost 60% of people, when surveyed, say they would like to ride a bike but they are concerned about safety issues. People in NSW are also missing out on the cost savings, health benefits and congestion reductions on offer if more people rode bikes each day. “We know talking to MP’s or people seeking election can be a daunting idea, so we have created resources to help people get in touch,” said General Manager of Public Affairs, Bastien Wallace. “The people standing to represent you want to hear what matters to you. Your emails, social media posts and meeting you in person helps them do a great job,” said Bastien. Bicycle NSW encourages everyone to check out the resources and make their voice heard.